I think we'll hit the end goal for a few days before our down payment check will clear (closing July 1, normally do end of month calculation for net worth). How are you folks valuing your home? I'm tempted to put the value as an asset worth (purchase price) * (0.94) to account for the likely realtor commission when selling. Or leave it as the actual cost we paid for it, but that seems like cheating. I'm not valuing my house in this thread, but in the 250 - 500 thread, I've been using zillow's zestimate (except when it sometimes goes crazy for a few weeks and ups my net worth by 50K). I am using the Zillow estimate that Mint pulls, but I have a BPO request sitting on my desk waiting to get mailed out. Once I have that back, I'll update to a fixed value. I leave mine as purchase price, which happened to be near the bottom of the market here. It is worth at least 50k more than I value it, but I never plan to sell it so I don't see much point in adjusting the value every month. I do adjust the values of investment properties about once a year though. Maybe I'll just stick purchase price there and update it every year never update it. Just became vested in my pension. They release the value yearly and I had underestimated it's value previously. It is worth $25,000 and I am now including it in my net worth since I am vested. I am now staring down $250,000! Hoping to get there sometime Q1 next year. I just started a side job that could prove rather lucrative, so that could come even sooner. You're all done with this thread if that's your net worth! Understood. I, on the other hand, plan to 'eat' my house. Once the kids are gone, there's not a whole lot of reasons we would keep the house. Would much rather rent as we travel or way downsize to a something sub-750 sq ft. This is for invested assets only. But incidentally I crossed the $300k mark in total net worth (includes house, car, and other physical assets) this month. Which feels pretty good considering my net worth moved into the black for the first time in 2011. The 1st 100k was definitely the hardest. Going to be an interesting few days, with modest market gains today we'll push over this and then write a check for 20% of it when we buy a house tomorrow. Well we squeaked in at $250358. Onwards and upwards we go to the next level - hoping to be back here on the investments and cash only track, looking forward to seeing you all soon either here, or the next level. Thank-you, I have felt very supported here. 401(K): $95,832 $95,608 I've maxed this for the year, so it should just be market fluctuations now. Savings: $4,435 $5,935 This is being rebuilt 3K a month starting now. I was maybe overzealous with my 401(K) funding and had to tap this for mortgage stuff. HELOC: ($35,900) ($36,271) Deciding whether to throw money at this (3.x% floating, comes down to 2% with my tax situation) or investment. Net worth = $113,761 $119,918 Up about 6K this month, which is great. My paychecks are now going to be ~250 bigger every two weeks, so hopefully this pace will accelerate a bit. Total NW including real estate and cash savings: $204,864. Just got my fist paycheck as a CA resident (moved here from Seattle with the same job I had up there) and OUCH with the state income tax! I knew it was coming but still unpleasant to see now that it's happened. Will require some adjusting. Drained part of my cash account to pay off a 0% interest credit card in June but still happy with a four digit increase. I am feeling like I am in a routine now. I'm kinda stunned at how fast the number is climbing. Between AirBNB, medical tourism, test riding bicycles, SEA, and stocks somehow we managed to increase our net worth by $13,116.02! I had sent in a rollover request with my last job to get the 401k into a Vanguard IRA. As it so happens the request on my employers side got sent out Tuesday before the Brexit, which I hadn't even heard of until John Oliver mentioned it on Sunday. The transaction went through selling the index fund at it's peak on Thursday, and made it into the Vanguard IRA after it had fallen 6%! It has now regained their losses, and what a gain for me. I didn't try to time the market, just happened to stumble on it and gained a quick 5%. My only regret is not having started using the 401k sooner. Congrats again to safambrit, the first to go up on the "Graduates" tab! Good bye everyone, hopefully I don't come back to this thread. Officially at ~$255,000k NW between my SO and I. Hope to see you guys in the $250k->$500k thread soon! Congrats to safambrit and 2b1s!!! Ditto! Congratulations! Keep it up. Congratz!!! Hope to join you soon! 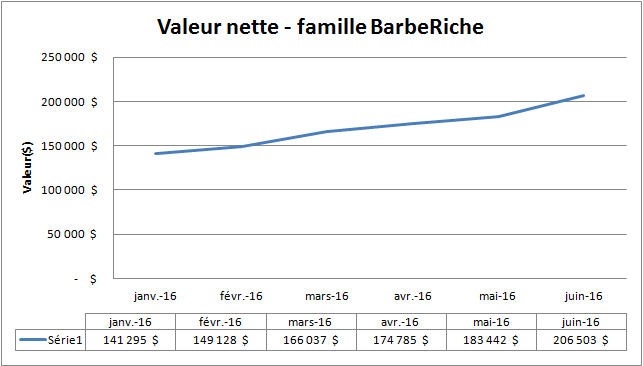 My biggest networth upgrade lifetime ---> + 23 061$ !!!! I'm just glad there was any gain at all this past month. The markets were a little bumpy and we went on a short trip and hosted family, so we were spending money everywhere. Firmly into the $100,000 range, now. My goals for 9/1 were: $110,000 as a 'easy' goal, $115,000 as a 'reasonable' goal, and $120,00 as a 'stretch' goal. At this pace, I should come really close to my 'reasonable' goal of $115,000, and with a little extra side hustling combined with some nice market gains, I could make a run at $120,000! 9/1/2015 is when I started tracking NW (and I started following MMM in earnest last summer) and I was at $77,000...so cool to see that sort of increase! I've achieved my 'easy' goal, and with two months left until my 9/1 end date, I should certainly hit the $115,000. The stretch goal will be tough, but that's why it's my stretch goal! June 1st: $110,836.03 my contributions went up this month - so doing 10%-- it kinds hurts! I started the year at about 100k and currently at about 160k. I'm about to be laid off in the next couple months so we'll see. Fortunately with all the savings I'd like to take a month or so off and do a motorcycle trip across the western US. I've been working 60-70 hr weeks nearly every week the last 7 years, with never more than 1 or 2 weeks of vacation. I'm getting burnt out and need a good recharge. Plus, with kids coming in the next 3-4 years I'm creating a "pre baby bucket list" of stuff to do now that we won't likely be able to do then. We are up $48,000 from last July, which is about $2k behind where I was hoping we would be. Not a bad year overall though. This is the thread for me! I'm jumping in. Our NW is around $120K - I need to grab the exact number from my spreadsheet at home tonight. We're going our best to pump it up about $3K-$4K per month through combination of student debt paydown (accelerating payments big time! ), car payments, increased investments in 401k and Roth, and mortgage payment. $150k by year's end probably won't happen unless I earn a few big bonuses. I've been steadily ratcheting up my retirement contributions over the past few months, which feels great. I'm also finding that my urge to buy new things is going away. When I think about buying something, I think about my big goals and then the little conveniences/clothes/makeup don't appeal to me as much as they used to. I'm still aiming for $120,000 by year's end, and with a ~$2k/month average over the past 4 months, I'm optimistic that I can do it. Havn't updated this in a while. Having a new baby will do that to you. We are currently at CHF 136'000. It is more, I'm still gathering some numbers, so I calculate with the lowest known number. Good job with those huge leaps forward! What did you do in April and June to make such huge progress? And I love your name btw...I'm not sure why. I don't have any historical data, as I just started tracking it recently. I'm at approx 230k. It's prob well over 250k, but the only numbers for my pension account I can see, are my contributions, the state's contributions aren't visible (of course). I don't have any historical data either, but I'm currently at 126,500$. Hoping to reach the 150,000$ by the end of the year (condo sale would help, but it's still very possible without it depending on the market). Had a nice windfall this month when VW made plans to buy our car back for $20,827! We will replace it with a mustachian Mazda 5 for <$6000, so, I'm including the remainder in our net worth. Should be leaving his thread by the end of the month! I had a similar thing happen with the extended warranty I got on my car when I bought it used. They forgot to file the paperwork for it and I realized that the warranty was going to cost me more in wasted maintenance (change oil every 5k mi or 3 mo even though the cars manual says every 15k or 12 mo) that had to be done at a shop and not by myself than I would ever get out of it. I had called to find out where the warranty paperwork was and they couldn't find it. A follow up later and they offered to either start the warranty from that day on or to refund the money, I chose the refund and have not regretted it.